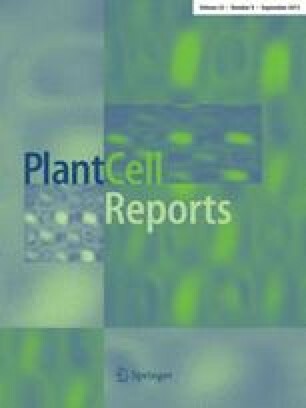 A procedure was developed for plant regeneration of Hybanthus enneaspermus, a rare ethnobotanical herb from the Deccan peninsula in India, through seed-derived callus. Seeds demonstrated a high induction frequency (69.4±2.8%) and a high yield (364.4±2.5 mg) of light-yellow friable callus on Murashige and Skoog's (MS) medium containing 2.6 μm NAA and 2.2 μm BA within 4 weeks of incubation. After 1 year of subculture, yellow friable and light-green compact calli types were established from initial light-yellow friable callus. Shoot differentiation was achieved from light-green compact callus, but not from yellow friable callus. Shoot differentiation resulted when light-green compact callus was transferred to MS medium supplemented with 8.8 μm BA and 2.6 μm NAA; the highest percentage of calli forming shoots (66.6±4.8%) and the highest number of shoots (8.9±0.3) were achieved in this medium. Differentiated shoot buds elongated to 4–5 cm within 4 weeks. The addition of casein hydrolysate (500 mg/l) and more potassium phosphate (1.86 mm) to the culture medium enhanced shoot differentiation. Rooting was achieved on the shoots using half-strength MS medium containing 4.8 μm IBA. About 70% of the plants were established in pots containing pure garden soil after 2 weeks of hardening. The regenerated plants were morphologically uniform and exhibited normal seed set.